I know what you’re thinking…the Feasts of the Holy Angels are over so what else is there to be said? Am I late in writing this little tribute to the angels? 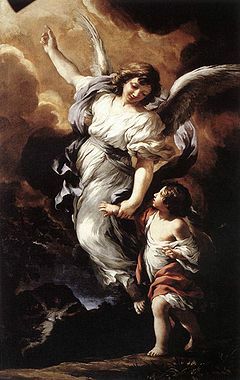 The word “angel” comes from the Greek angelos, meaning messenger. While celebrating the Feast of the Holy Angels recently, I thought also of a different specie of angels or messengers that are sent by God to us in many different ways, shapes and forms. They’re the kind that are very much visible to our human eyes if only we look more closely into the events in our daily life. As I see it, angels are all around us. As Dominicans, our mission is to praise, to bless, to preach, and to share with others the fruits of our contemplation. 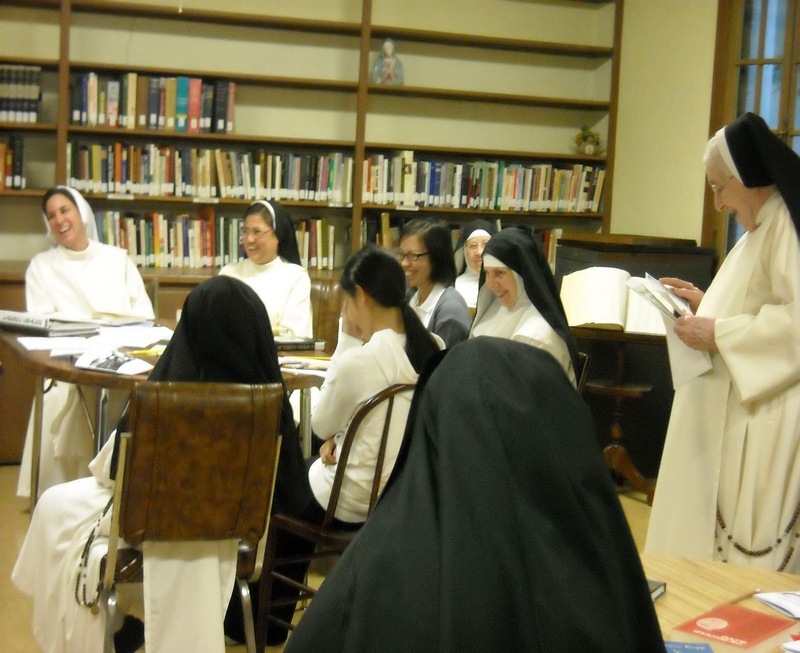 For us as Dominican nuns, a good amount of our time is spent in contemplation and prayer to accompany our Brothers in their preaching for the salvation of the world. Though our altar bread business is our main source of income, we depend heavily on the generosity and kindness of others to help maintain our contemplative life and we thank God that he has sent us many wonderful and generous ‘Angels’ who help us along our journey. 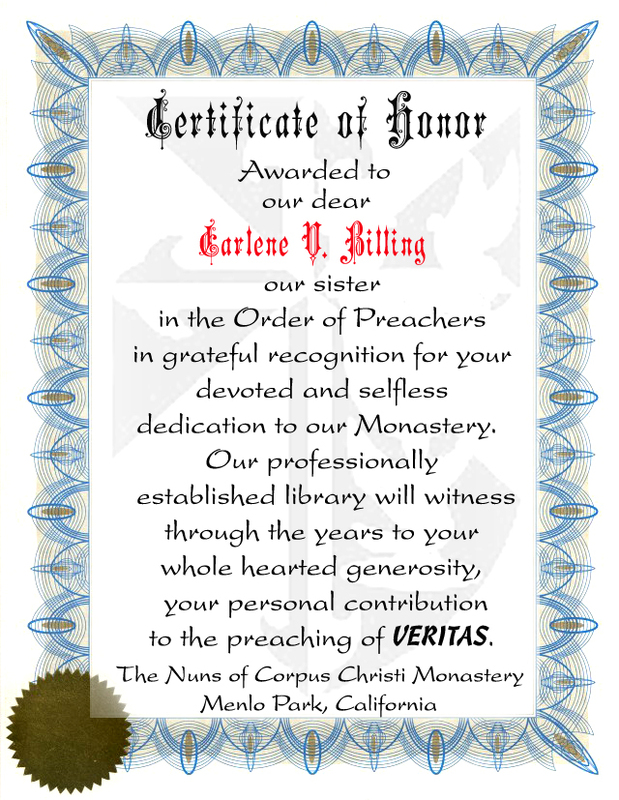 Earlene V. Billing came to Corpus Christi Monastery one day in 1986 for an enrollment into our Venite Adoremus Society. By God’s providence, Earlene came back shortly after and volunteered to work in the infirmary taking care of our infirm and elderly sisters. Earlene was raised by the Dominican Sisters of Mission San Jose and at the young age of 10 helped the sisters in the infirmary there. She was an experienced and a natural caregiver and was most welcomed and loved by our sisters. In knowing that Earlene has a degree in Master of Library Science with many years of experience working as a Librarian and Consultant, overseeing some of the public school libraries in the Bay Area, our head Librarian, Sister Maura, was eager to have her help organize and catalogue the books in our library. 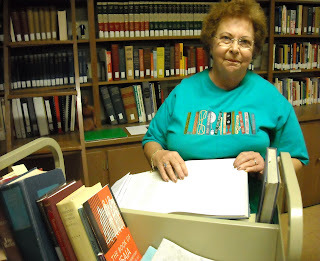 Consequently, after her retirement Earlene has devoted many hours teaching, organizing and cataloging the growing number of 7000 books in our library. Sister Maura was very hopeful that since Earlene knew many librarians, she could ask them to come and put our library in order. She thought that working together perhaps they could do it in ONE day! Understandably, there was not one retired librarian who would be so out of her mind as Earlene to spend the hours it would take for our library to be properly ordered. 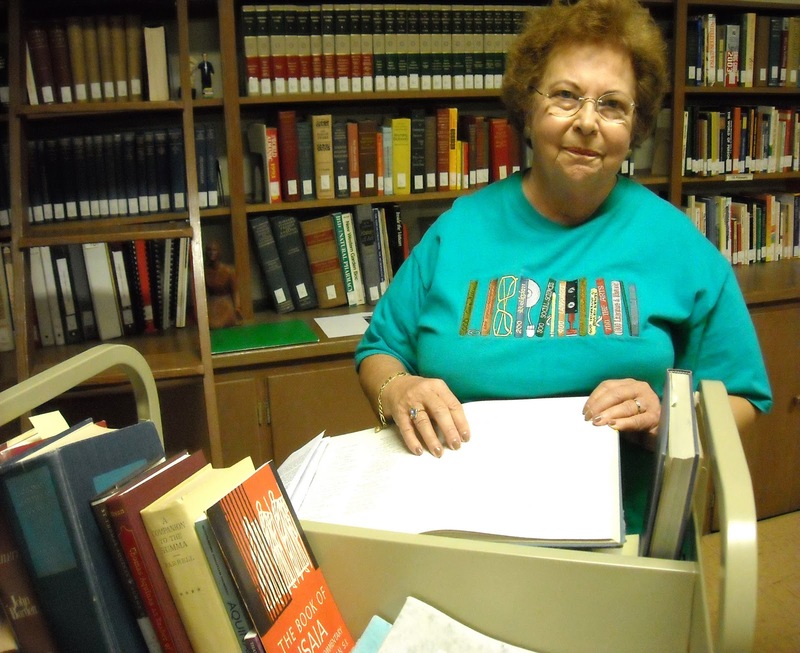 Earlene has spent endless hours and days with tremendous patience teaching and working in our library...all out of her deep love for God and our Dominican family. (Earlene is also a member of the laity of our Dominican Order.) 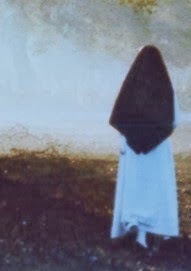 Truly, God’s message of love and providence has come to our life through Earlene who has acted in an “angelic” way. Earlene has presently moved to Jonesboro, Arkansas, where she will be helping her son Larry Billing with his blooming business as owner of the Shadrachs Coffee and Roasting Company, and with her daughter-in-law, Risa in taking care of their two little boys and her expected granddaughter due on the Feast of St. Luke. 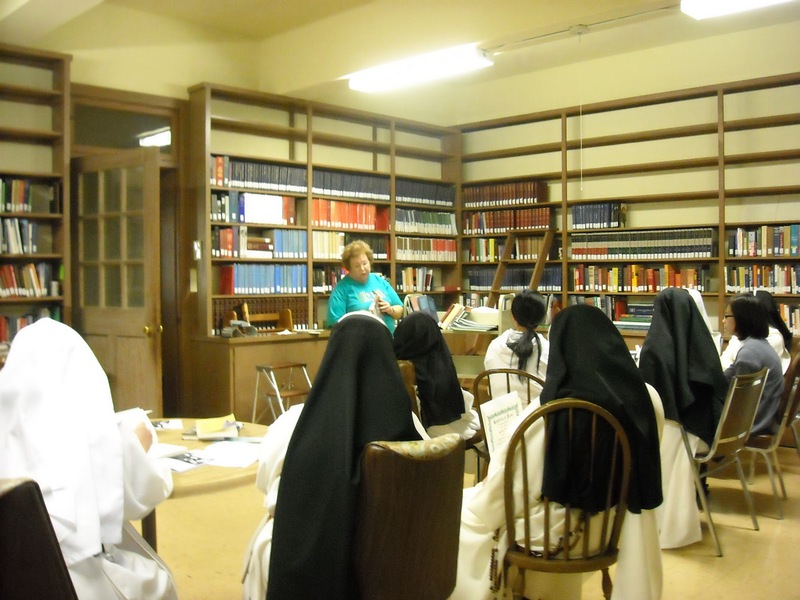 Since study is one of the important charisms of our Dominican Order, providing us with a well-organized and a professionally established library, Earlene left us a legacy that will be remembered and treasured for years to come. 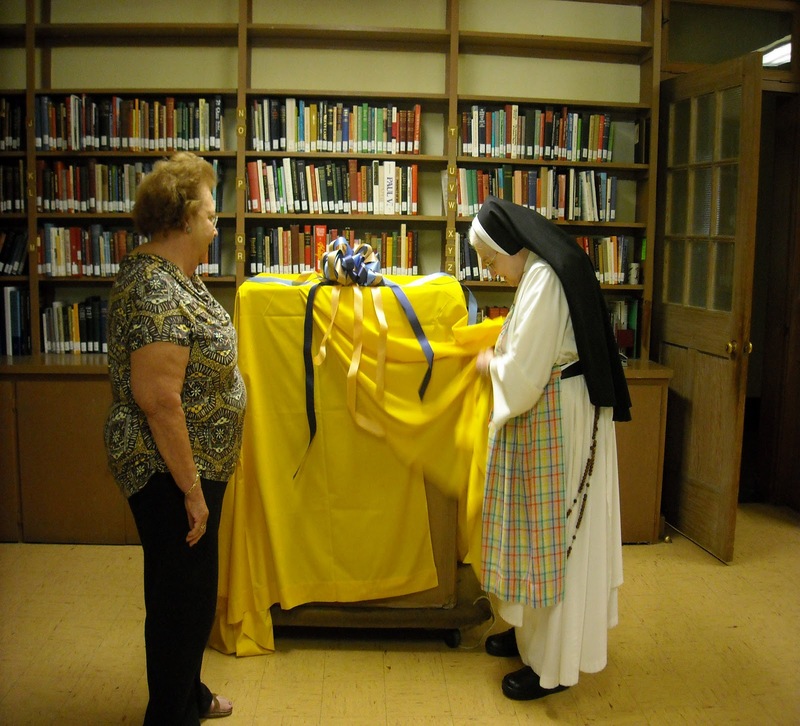 Not satisfied with her precious time donated to us for many years, before the last farewell, Earlene opened her loving heart once again and gave the community a workshop to help the sisters, and an expensive library truck as a Diamond Jubilee gift to our Sister Maura. Sister had dreamed of having one for years but we could not afford it. Naturally, after weeks of working closely with Earlene and Sister Maura and learning the "ropes" from them, I’ve come to appreciate librarians! They must attend carefully to detail, getting spellings and dates and punctuation exactly right. They must often deal with large backlogs of materials needing processing so it is important for them to communicate with people in different areas to assess the priority. They also must stay abreast of rapid changes in the field of information access as I’ve experienced recently. So as we change librarians, it is also a sign of a new era…an era of high speed of changing technology, but still an epic of service to those who come seeking to advance in their learning and knowledge of God. My heart has been overwhelmed with so much gratitude to God and to all of our benefactors or Angels who have kindly and lovingly dedicated their time and resources to help us since the foundation of our monastery. A note of appreciation is also given to our Dominican Friar, Father Patrick Labelle, O.P. who donated his library of approximately 600 fine books to our collection before he left his position as director of the Vallombrosa Center for his new assignment as Prior of St. Dominic Priory in San Francisco. As you can see I will have a giant task ahead of me to continue organizing the library so that our sisters will continue to have sufficient and up-to-date resources for their study and contemplation. Earlene and I have developed a system to catalog the non-book materials such as audio tapes, CDs, DVDs, etc. thanks to the help of the head librarian at St. Patrick's Seminary - Dr. Cecil White and his staff who graciously spent their time to assist us; and to Nicolas Szegada, a librarian at the Menlo Park Library who optimistically and happily passed on to us a few good tricks of the trade and free on-line resources for librarians! We pray that God will continue to bless our dear friend Earlene and her family, and all those who do us good as we offer prayers for them each day before the Eucharistic Lord who alone can repay them with all that is His to give.